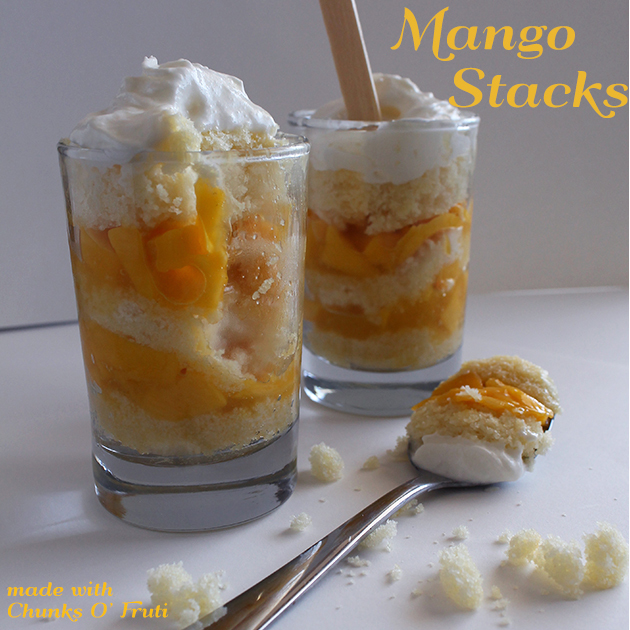 If you’re headed to a party this weekend and need a quick but easy recipe for something truly impressive, making these simple Mango Shortcake Stacks is a great way to assemble some ingredients together in a fun way to give your dessert some pop with very little effort. Because this recipe uses pre-made ingredients, it takes no time at all to assemble but looks great. It also doesn’t take any special skills so you look like a professional chef without having to go to culinary school! Slice your pound cake into a 1/4 inch slices and use one tasting glass to cut out 12 circles of pound cake. You can use a knife to separate the edge from the glass if it sticks. Set these aside and clean the tasting glass. Prepare the mango and dice into small pieces. Soften the Fruti Mango bar and cut into small squares. 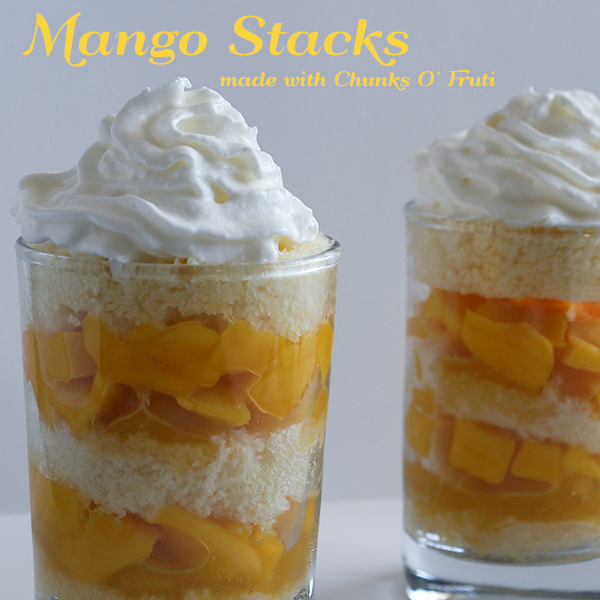 Stack the ingredients inside the tasting glass by layering pound cake, cubes of Fruti Mango bar, diced mango, and starting the pattern over until the glasses are completely full. As the Fruti bar melts, the layers will compact together more so be sure to slightly overfill it. Chill and top with whipped cream just before serving. We always love to see what people do with our Fruti bars so if you’ve used them in a creative way, let us know on our Facebook page and we’ll share it on our blog. These look amazing, refreshing, easy and quick – what a winning combination. Thank you for sharing on the BBQ Block Party. So glad you stopped by. Wishing you a great holiday weekend.